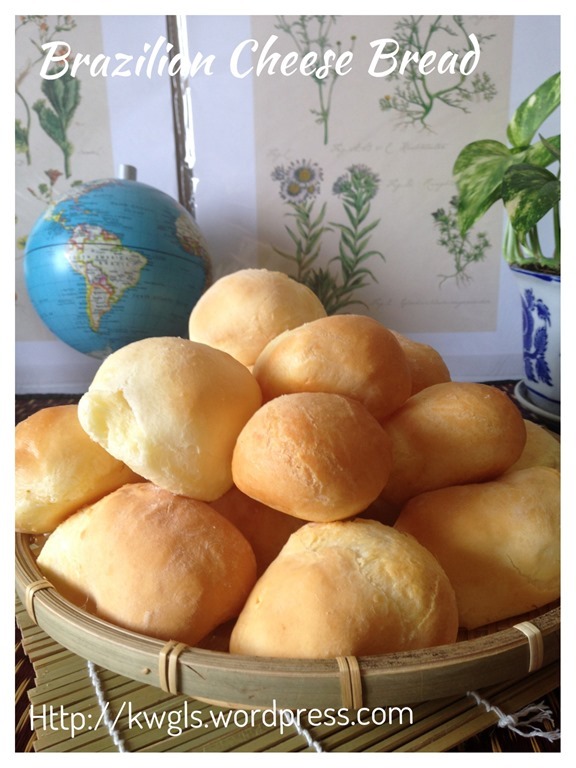 When I posted my cheesy biscuit bites yesterday, one member in a Facebook Group (Ms. Flora Makan) offered me a recipe on Brazilian cheese bread, pão de queijo . 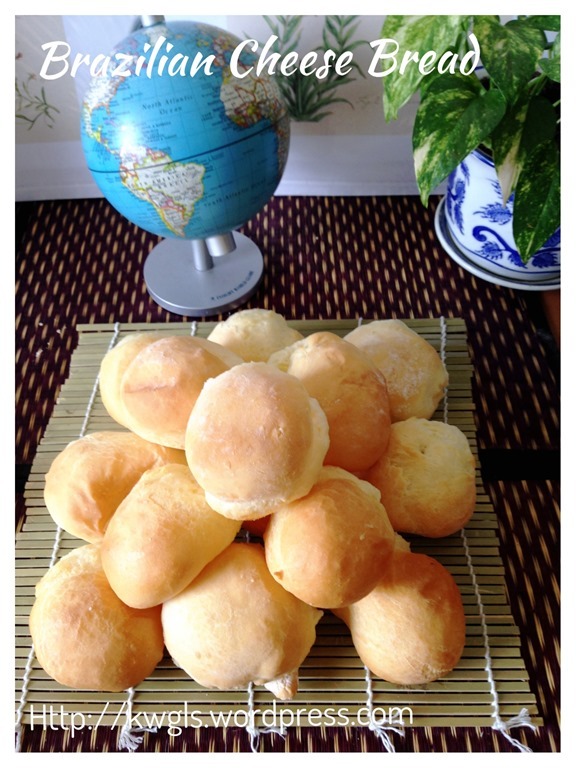 She said this is a cheesy aroma bun that kids will like. Immediately she wrote down the recipe in the comment section and I truly appreciate her good intention.. 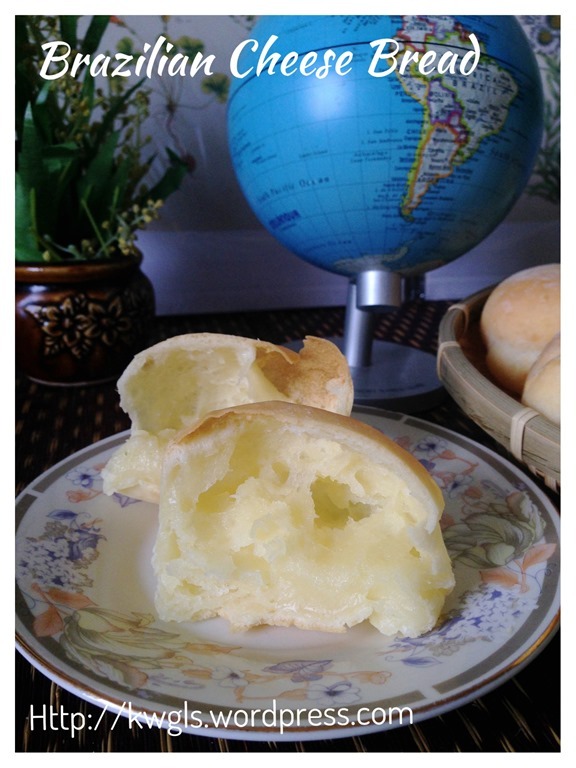 In return for her graciousness, I have decided to prepare these well known Brazilian cheese bread ..Pao de Queijo is a very famous Brazil gluten free snack. 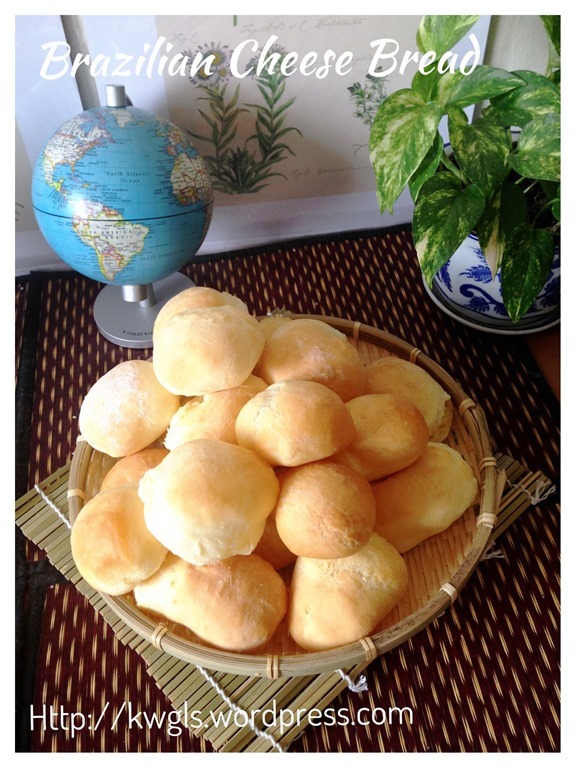 Though the name is termed as bread or buns, it is prepared not using wheat flour but using tapioca flour or starch .In fact, other starches such as corn starch, potatoes starch, sago starch can be used as well. Unlike normal bread, it had a crusty exterior but springy and fluffy interior like all other cakes prepared using starches. 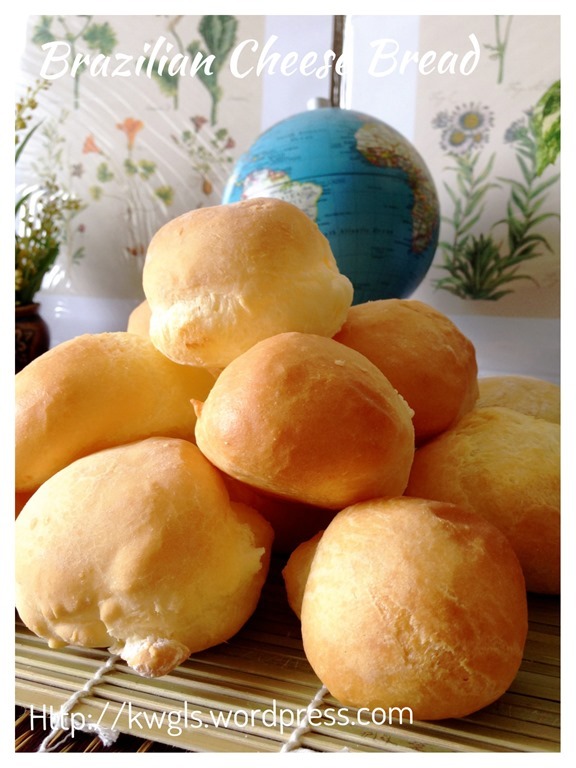 “Cheese buns, cheese breads, pão de queijo or originally known as chipá are a variety of small, baked, cheese-flavoured rolls, a popular snack and breakfast food in Brazil ( in the state of Minas Gerais), Argentina (in some regions) and Paraguay. 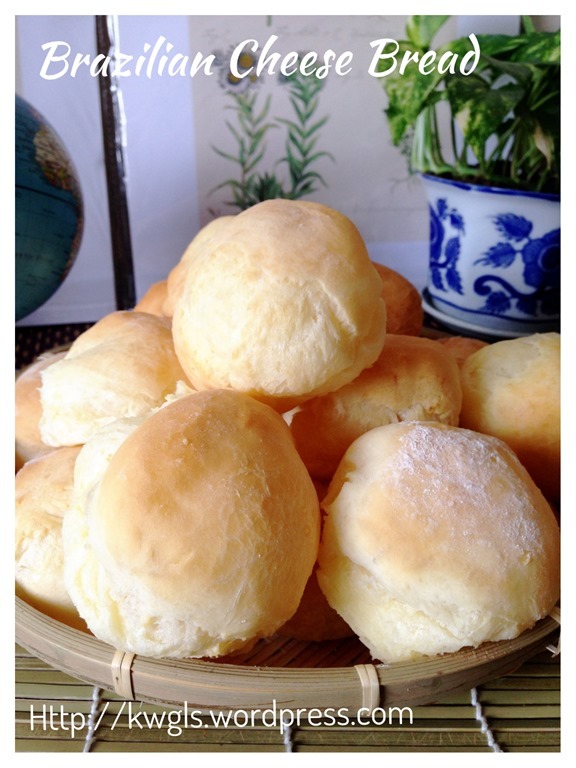 Its origin is uncertain; it is speculated that the recipe has existed since the eighteenth century in Minas Gerais (Brazil), but it became popular throughout the country after the 1950s. 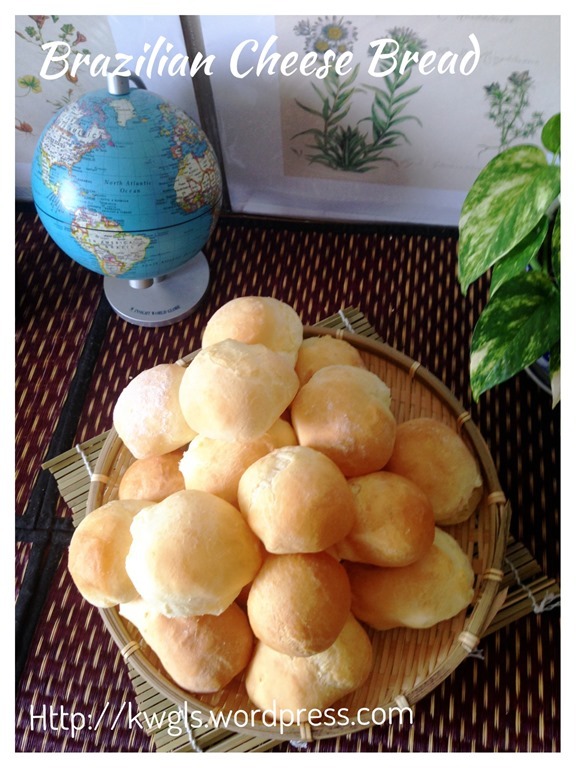 Cheese buns are distinctive not only because they are made of cassava or corn flour, but also because the inside is chewy and moist. Its size may range from 2 cm to 15 cm (1 to 6 inches) in diameter and approximately 5 cm (2 inches) in height. 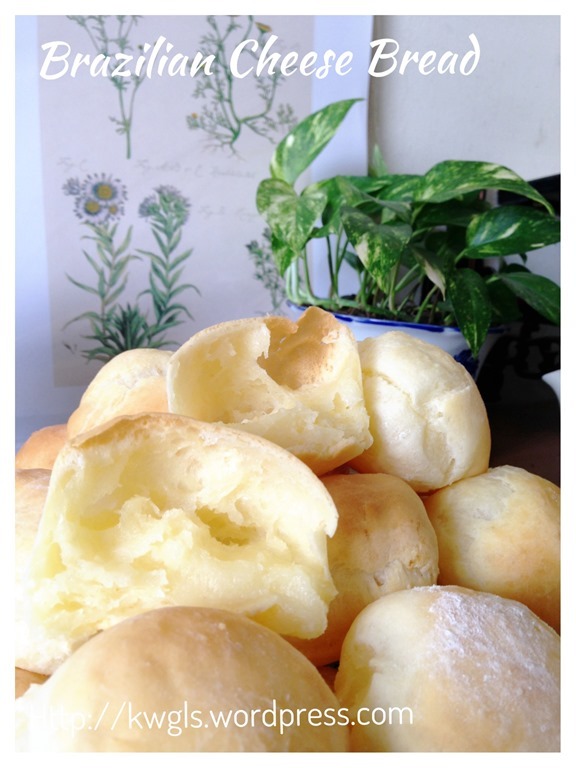 There are two versions of preparing this cheese buns. 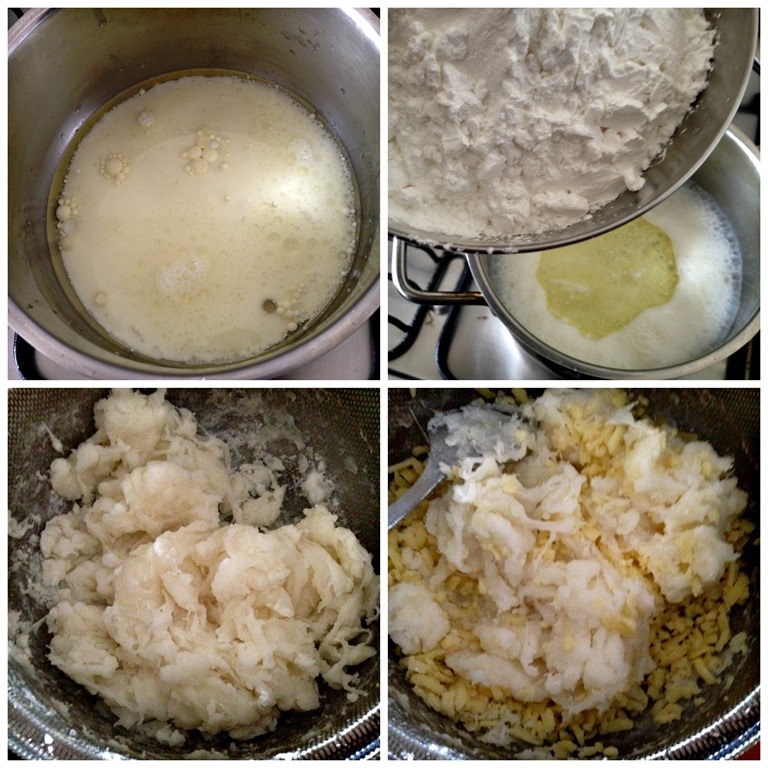 One is to lightly cook the tapioca starch and add eggs until it form a dough. This is the method that I am sharing with all. Another method is to use blender to blend all the raw ingredients and bake in cupcake cups. * Since measurement were given to me in cups, I will advise readers to use standard measuring cups if possible. In a pan, put in all the liquid ingredients (water, milk and cooking oil) and salt, bring to boil. Once boiled, off the heat, pour the tapioca flour and stir until well combined. Don’t be alarmed by the lumps. Let it cool for about 15 minutes, add the parmesan cheese (or cheddar cheese). Stir until well mix. 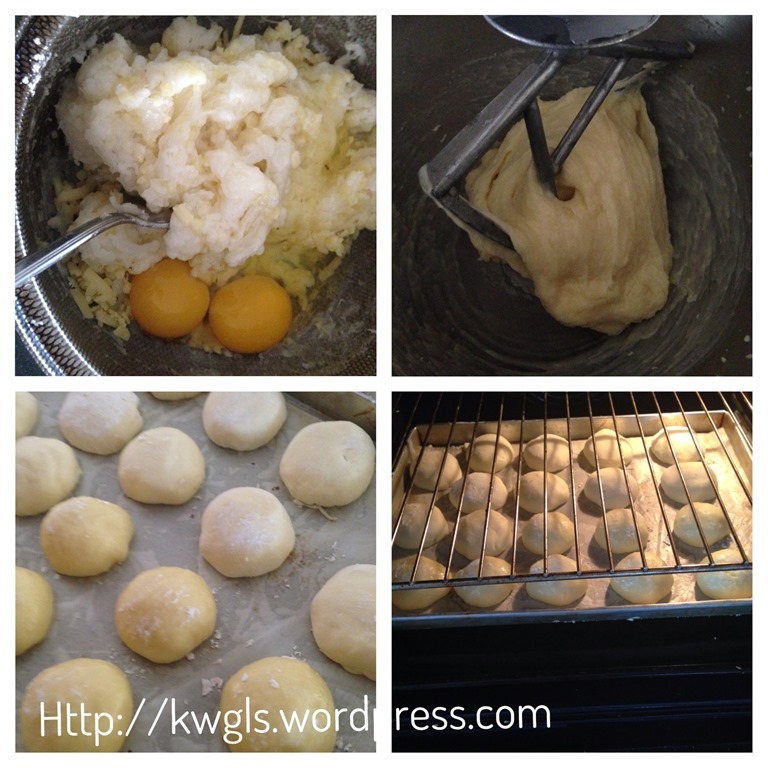 Crack the eggs into the dough and transfer to a whisking bowl of a standing mixer. Beat the mixture until the mixture is smooth (about 5-10 minutes). 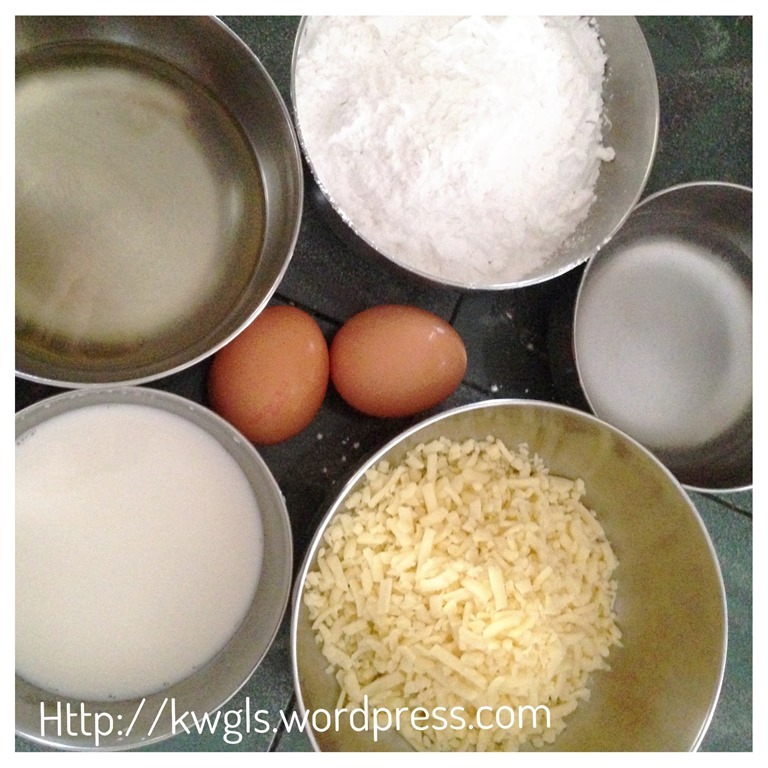 If you do not have the mixer, you can use hand to manually “knead” the dough until the eggs were finally incorporated. Once the dough is ready, divide the dough equally into 12 buns, shape round and place in the baking tray. 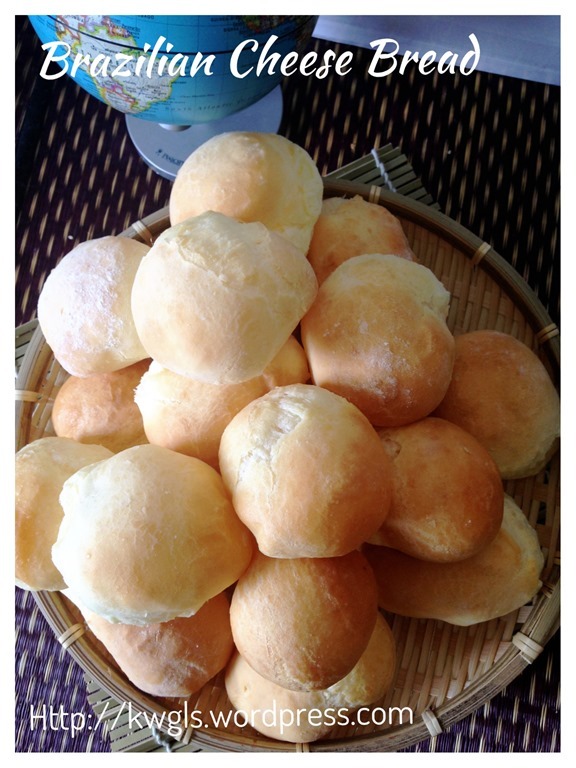 Note that the dough can be rather soft, flour the work surface and your hand with additional tapioca or cassava flour to facilitate the shaping. Bake in the pre-heated oven of 180 degree Celsius for about 15-20 minutes on when the top is brown. 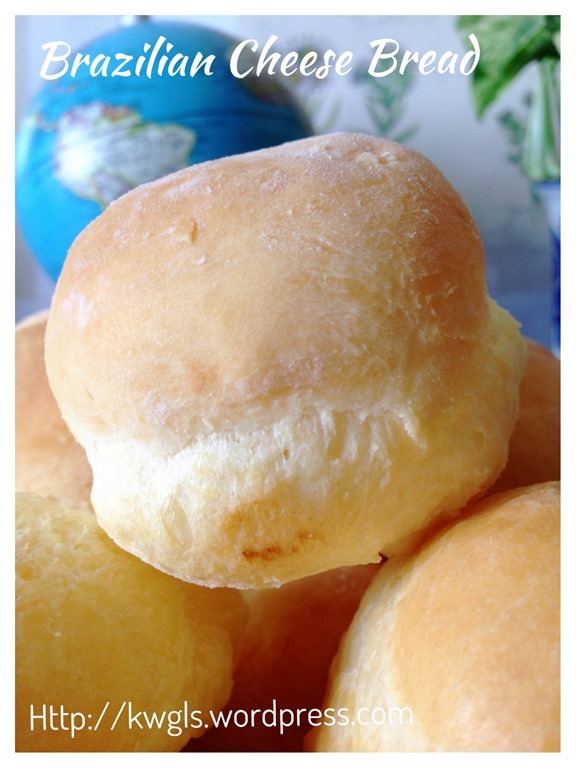 In this process, you will witness the buns start to puff up. The bread is best served warm when out of the oven as a snack. 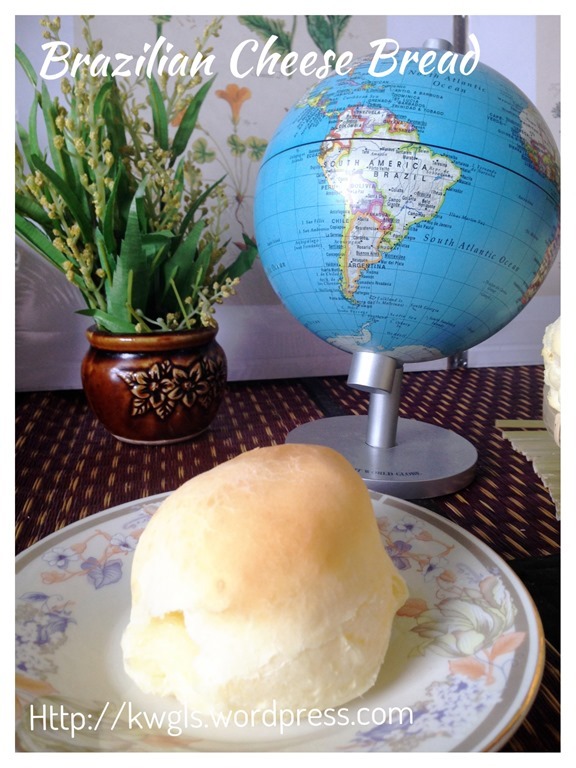 Though there are many recipes on the web for this famous Brazilian Cheese Buns, but I like verbal recipes and I have to thank Ms Floral Makan for voluntarily providing this precious recipe of hers for me to share with readers. Thanks Ms. Flora Makan. 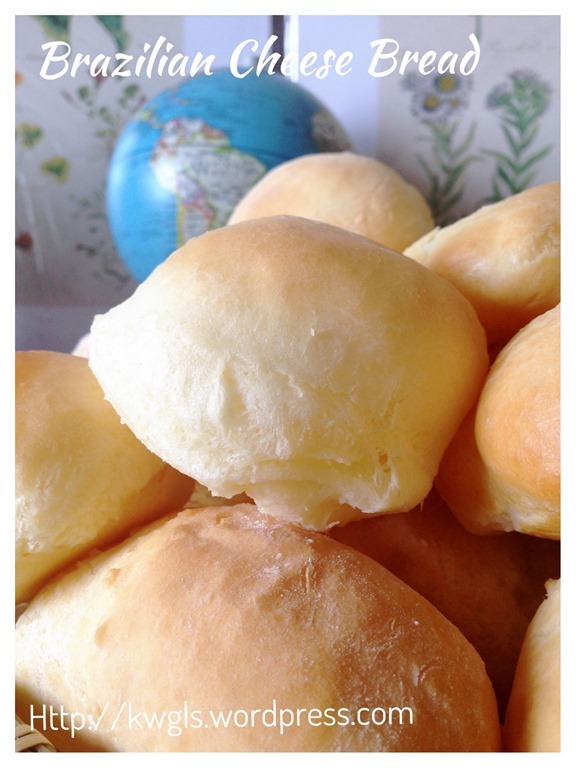 Please do try preparing some of these cheesy Brazilian buns and see if it suits your taste buds. 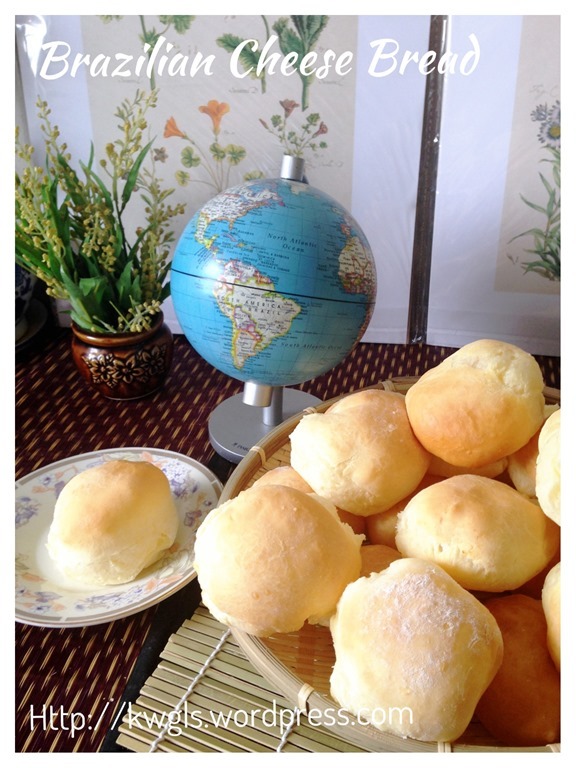 This entry was posted in Breads and Pizza, Food Preparation Series, Snacks and tagged 8, brazillian cheese bread, brazillian cheese buns, chipá, GUAI SHU SHU, Guaishushu, kenneth goh, pão de queijo, postaday, 巴西奶酪面包. Bookmark the permalink. Dear Kenneth, does the other version requires eggs too? Hi Kenneth, when you say cheddar cheese, not the sliced type? Dear Kenneth, the mixture become like cheese sauce after i knead using bread machine, any idea what happen. ..
Hi, can the dough be prepared and left in fridge to be used for baking the next morning? Never try before and rather unsure. Hi Kenneth, I have tried out the recipe and it was great! Just wondering if you have any suggestion to substitute the cheese with any other ingredient? No cheese will be plain. How about some cocoa powder ? Thanks for the suggestion I will try that out. Hi, Kenneth I have tried today with cocoa powder and I add sesame too, taste good! Thanks! Hi, thanks for the recipe! do these keep well In the fridge?